Yego Moto || Change The Way You Hire A Moto! Haggle Free and Hassle Free! YEGOMOTO Will Change The Way You Hire A Moto! Simply flag down a YEGOMOTO, tell the Driver where to go, hop on, and be on your way! Passengers will pay the fare displayed on the YEGOMOTO Meter at the end of a trip. Fares are calculated automatically according to distance travelled. Additional waiting charges may apply. No more haggling on how much you need to pay. Imagine the time you will save, every single day! YEGOMOTO adds precious minutes back to your life and gets you to your destination quicker. On a regular Moto if you change your mind midway, want to get off earlier, or go somewhere else you need to stop and negotiate all over again. If the Moto Driver and you can’t agree, you have to get off, pay and find another Moto. The YEGOMOTO meter will take care of the change and you will only pay the fare as per the meter, according to the actual distance travelled and time taken. Ride Happy, Every Time All The Time! For your utmost safety, the YEGOMOTO Driver will provide you with a top quality full-face helmet. All you have to do is secure the helmet strap under your chin and smile! Our Drivers are trained to be courteous, follow traffic rules and to drive safely. Keeping you safe and happy is our priority. We know how important it is to stay connected, unfortunately phone batteries don’t last all day. Each YEGOMOTO has a waterproof, fast phone charger. Remember to carry your charging cable. Stay charged, smile and enjoy the ride! No Cash? No Change? No Problem! Now you can pay for your YEGOMOTO ride using MTN Mobile Money MTN Tap Pay cards or YEGOMOTO Ride-Tap-Pay cards. YEGOMOTO is a complete service delivery platform. Soon we will deliver food, groceries and even salon or spa services to your doorstep. Whether you need to send a package to someone, need a plumber or an electrician? Just leave it to us. We will send an expert because we understand; your time matters! YEGOMOTO is a Cloud based IOT platform. All YEGOMOTO Meters are connected to a centralized monitoring and Management System. The Meters on our bikes are intelligent; they provide navigation, digital and contactless payments. Soon you will be able to download our App to call for a Moto, pre-book a ride and access our Butler Services. Moto Drivers are the key team members of YEGOMOTO. They play a critical role in keeping the city moving. We will train them continuously, provide them with the best equipment and ensure that they are fairly compensated. Our platform and Butler Services will help them earn additional income from our e-commerce services. Step 1 - Spot our drivers by their bright red YEGOMOTO helmets. Step 2 - Ask your driver to Start the Trip on YEGOMOTO. Remember to secure the helmet strap. Step 3 - At your destination, the driver will End the Trip. Check your fare summary, pay and leave happy. We are excited about launching YEGOMOTO in Kigali. After Rwanda, we plan to roll the service out in other African countries.We are looking for team members, who would like to be a part of our incredible journey. If you think you have what it takes, write to us at jobs@yegomoto.com and tell us why we should invite you for a coffee. Yego Innovision Ltd., Rwanda is a subsidiary of Kommlabs Pte. Ltd., Singapore. Our smart urban mobility solutions aim to make Rwanda cities world-class in line with its Vision 2020. A different email ID is registered with this number. Do you want to update your email ID ? 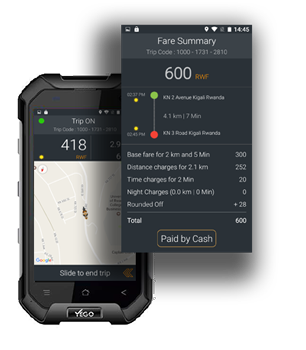 Get your YEGOMOTO Fare Receipt by Email.